When injury and illness prevents you from training and racing, what do you do? This is what I did. Now to see if I can get it published. Would appreciate any advice, or interest! If the police don’t kill them, the Outback just might. 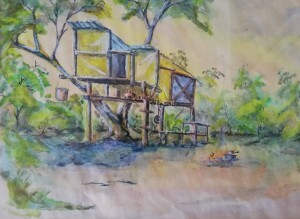 For a few wonderful months in 1989, I lived in a tree in Western Australia. I spent my days trying to sketch and paint the outback, and searching for gold. Neither of which I succeeded at. But my time there left me with a rejuvenated interest in nature, science and history. When I returned to Ireland, I studied natural science in Trinity and graduated with a degree in Geology in 1995. Occasionally, when living at the treehouse, I would drive the seventy kilometres to the Ora Banda Inn and General Store for supplies and refreshments. Some years later, I went back to the area to work as a geologist and discovered the Ora Banda Inn a burnt-out shell. The story of Ora Banda and my own experiences working on a nearby sheep station and later in the gold and iron ore industries in western Australia, have inspired and informed my debut novel, The Magpie and The Mulga Trap. … a strong opening, with superb atmosphere and sense of place. The opening scene was unusual and absorbing. Although narrated in a relaxed pace, the voice keeps the reader engaged through details. Equally, while description dominates, the structure is varied and stylistically confident. The dialogue is vivid and characters seem to be introduced effortlessly. Download PDF Chapter 1 Sample Below The Magpie and The Mulga Trap Eventually, they took away all the gold their technologies could reach and when the time came; they took away their town. They left behind the scars of mining and their dead. Good man,Alan a great read.